What every parent needs to know about negotiating, incentives, outsourcing, and other strategies to solve the economic management problem that is parenting. Like any new parent, Joshua Gans felt joy mixed with anxiety upon the birth of his first child. Who was this blanket-swaddled small person and what did she want? Unlike most parents, however, Gans is an economist, and he began to apply the tools of his trade to raising his children. He saw his new life as one big economic management problem—and if economics helped him think about parenting, parenting illuminated certain economic principles. 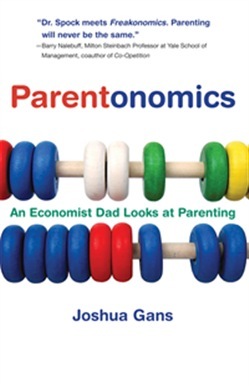 Parentonomics is the entertaining, enlightening, and often hilarious fruit of his “research.” Incentives, Gans shows us, are as risky in parenting as in business. An older sister who is recruited to help toilet train her younger brother for a share in the reward given for each successful visit to the bathroom, for example, could give the trainee drinks of water to make the rewards more frequent. (Economics later offered another, better toilet training solution: outsourcing. For their third child, Gans and his wife put it in the hands of professionals—the day care providers.) Gans gives us the parentonomic view of delivery (if the mother shares her pain by yelling at the father, doesn't it really create more aggregate pain? ), sleep (the screams of a baby are like an offer: “I'll stop screaming if you give me attention”), food (a question of marketing), travel (“the best thing you can say about traveling with children is that they are worse than baggage”), punishment (and threat credibility), birthday party time management, and more. Parents: if you're reading Parentonomics in the presence of other people, you'll be unable to keep yourself from reading the funny parts out loud. And if you're reading it late at night and wake a child with your laughter—well, you'll have some guidelines for negotiating a return to bed. Acquista Parentonomics in Epub: dopo aver letto l’ebook Parentonomics di Joshua Gans ti invitiamo a lasciarci una Recensione qui sotto: sarà utile agli utenti che non abbiano ancora letto questo libro e che vogliano avere delle opinioni altrui. L’opinione su di un libro è molto soggettiva e per questo leggere eventuali recensioni negative non ci dovrà frenare dall’acquisto, anzi dovrà spingerci ad acquistare il libro in fretta per poter dire la nostra ed eventualmente smentire quanto commentato da altri, contribuendo ad arricchire più possibile i commenti e dare sempre più spunti di confronto al pubblico online.